The former band Vital Signs was more of a metal band in every sense of the word. However, they came to a point where they wanted to play in a more traditional rock band. Their lead vocalist, Alex Runk, was made to sing rock and has what bassist Eric Rembecki describes as a ‘tremendous singing voice’. It was really a no-brainer that Vital Signs change their sound – and their name – to fit their new image. 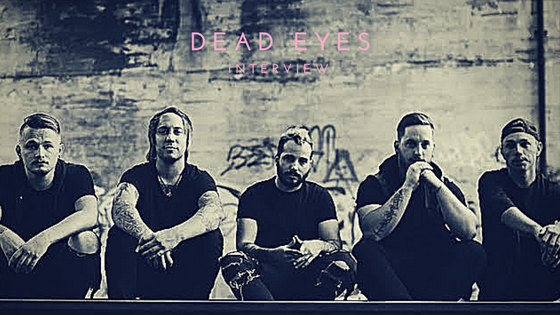 The common theme for Lancaster, PA band Dead Eyes is a revolution of sorts as far as making sure voices are heard. Not just their voices, but the voices of those who have been afraid to say anything before. Their revolution is about using your voice to stand up for what you believe in. It’s not about what should or shouldn’t be said in society’s rules but it’s about what needs to be said. The name Dead Eyes came to Runk around late summer of 2016 and really matches the theme they’ve created. “We wanted to start spreading a message about things that are going on in the world that piss us off and that some people turn a blind eye to, or as we like to say, a dead eye to… We want to be the reason that you can stand up and actually speak about these things that are bothering you because we’re speaking about what’s bothering us,” Rembecki said. They started in North Carolina, working with producers that helped them redevelop their sound. The rock sound that they were looking for was created but parts of their metal days stuck with them. That edge is what separates them from the rest of the genre. After bringing their new sound back to Pennsylvania, they’ve been actively working on finishing up their EP. As of the time of this interview, an album name and release date has yet to be determined. However, Rembecki said that each song has its own mini theme that ties into the mega theme. They aren’t afraid about speaking about a variety of different topics and that’s going to make this EP all the more relatable. In this band of brothers, they’ve come a long way from playing small metal shows in Lancaster. Now that they’ve formed a more concise plan of what they want to accomplish, they are constantly building each other up to make the successes feel like a group effort. With that teamwork and dedication, this will be an EP that’s well worth the wait.